I never used to be a fan of circle lenses. I was born with extremely sensitive eyes and wearing contact lenses were a nightmare, especially when I would take almost half an hour just trying to insert them into my eyes (yikes). A few years ago my sister introduced me to the Fairy Princess 1 Day Circle Lenses - and I thought, for video purposes, I'd give them a shot. I feel that circle lenses really have an impact on the outcome of the video and the makeup look that I was doing. It makes the eyes look bolder, stronger and more awake by creating an illusion of enlarged pupils as well as glistening, almost sparkly eyes. However I would never wear them on a daily basis, nor would I wear them out on any occasion - it's just not something I'm used to and somehow I don't think it's necessary. I was surprised by how easy it was to put on and take off the Fairy 1 Days. I'd gotten used to it quickly and I love how they sit comfortably on my eyes. I've never worn them for a prolonged period of time as I mainly use them for filming purposes, but as a circle lens newbie, I was very pleased with this brand and didn't need to try any other brand since. However, Pinkicon recently sent me the Brigitte circle lenses, and they were much harder to take off. They didn't look as natural and appeared harsh. I think I may have even scratched my eyeball when struggling to remove them as they pretty much glued to my eyes. I started to panic, and I am afraid to wear them again! You can see me wearing the Brigitte circle lenses in this video. 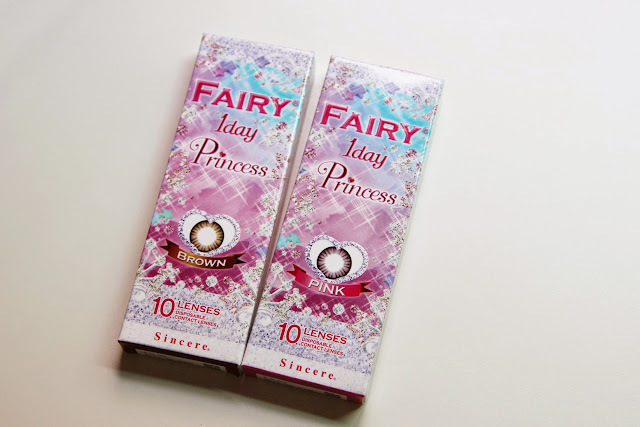 I've stocked up on the Fairy 1 Days in pink and brown - brown being the most natural. It lightens the eye color yet does not look as forced and pretentious as most circle lenses I've seen on other people. I'm sorry I wasn't able to provide a review on how long-wearing the circle lenses are, but I can say for sure that I can wear these for up to 2 hours without my eyes feeling dry. Do you wear circle lenses? If so, which brand would you recommend? Disclaimer: I have purchased these circle lenses with my own money in the past, and have also been sent them from Pinkicon.com. All opinions as usual, are my own and completely honest. This post is not sponsored.